Sea to Summit Trek TkII 18 Sleeping Bag. The Trek™ down sleeping bag brings the comfort of a tapered-rectangular shape and the versatility of a dual-zip ventilation system to wherever your travels may take you. 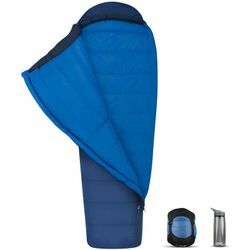 The full-length side zipper and secondary foot box zipper allow you to increase ventilation or open the Trek completely flat like a comforter, and the quality down will keep you warm and snug on chilly nights.